Updated Friday September 7, 2018 by Red Circle Hockey. Put on the socks you plan to skate with, put on the skate and push your toes all the way to the front of the skate. With a properly fitted skate, you should be able to slide one finger behind your heel. Next, sit down and kick your heel firmly into the back of the boot. Tighten the laces firmly through the first 2-3 eyelets so that the skate is snug near the toe. Lace the next 3-4 eyelets a little looser to give your arch room to flex. Tighten the laces firmly through the remaining eyelets to give strong support to your ankle. The eyelets should be 1 1/2 to 2 inches apart; if not, consider a narrower or wider skate, as appropriate. For children, you can get 1/2 size bigger to accommodate growing feet - but, any bigger can cause blisters on feet and a breakdown of the sides of the boot. 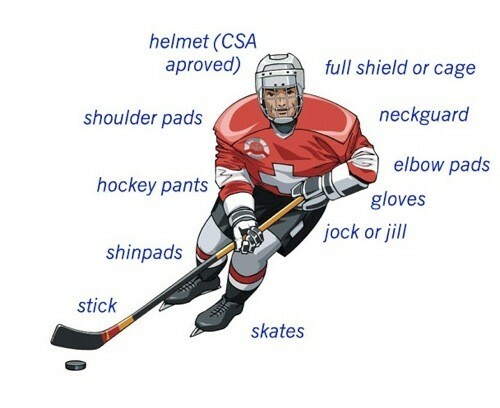 To help break in your new skates, put them on and wear them around the house (with skate guards, of course!) for a few hours. This will help break them in and cause you less discomfort when you first use them. As an added benefit this will help strengthen your ankles which will help you skate better. These will be needed for practice and possibly some games. Team socks are usually supplied with team shirts for our Mite and Tyke divisions, however the other divisions from Novice and up are required to supply their own socks. You'll want your own practice jersey. This should be loose fitting and comfortable. Practice Jersey's do not have to be blank with nothing on it. Team Jerseys will be distributed to everyone and in most divisions must be returned at the end of the season. You will want to get a bag big enough and durable enough to hold all equipment excluding the stick. Some bags will hold that for you too. A suggestion is to look for a bag with wheels to make it easier for your child, or you, to cart to and from your car. Don't forget your water bottles to keep hydrated.